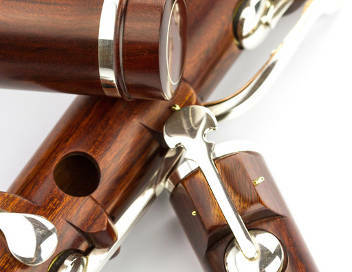 The Windward “simple system” keyed Pratten is a versatile, richly toned flute with all the qualities of our keyless Pratten. It spans a full three octaves, and is a fine instrument for most genres of music... Celtic and Jazz, as well as chamber and orchestral performance. The aesthetic of our keys complements the spare elegance of the standard Windward flute. The keys are hand-forged in sterling silver, mounted on integral wood key-blocks, and sprung using the traditional phosphor-bronze flat springs. Because each key is individually hand forged, the keys can be custom formed to suit the player’s hand, which may be helpful for those players with smaller hands or past injuries. By special order, we make brass, bronze or silver seat inserts for each keyed tone-hole. Our pads are white or black Valentino Greenbacks, custom made for us by J. L. Smith & Co.